Born on Melbourne Cup Day in 1970, Grace became Zia (meaning Aunty) after the birth of her nephew Teague in 2004. "When I first held him in my arms, I was overwhelmed by a kind of love that I didn't know existed - so expansive and unconditional. I felt deeply connected to this little person, which soon led to a sense of being connected to all little beings. Children are magical and I like who I am when I'm around them - they bring out the best in me." Unable to have her own children, Zia Grace once found it difficult to be around young families. "It would remind me of what I was missing, but somehow becoming an aunty transformed my life. I was able to open up and receive the love, joy and humour children bring. It has also unearthed this raw, unbridled creativity that I had suppressed since my own childhood - it's very exciting. " 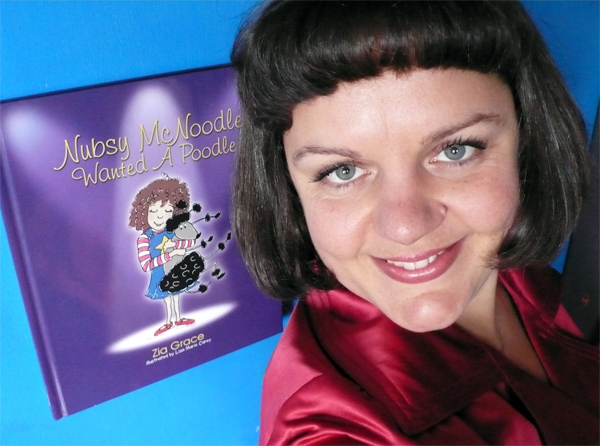 Zia Grace describes writing her first children's book, Nubsy McNoodle Wanted A Poodle, as an organic experience born from this transformation. "It was like something just went 'click' inside. In the early hours of February 24 (2007), whilst staying with friends whose children are nicknamed Nubsy McNoodle and Bullfrog, I heard the words "Nubsy McNoodle wanted a poodle" swirling around in my head over and over until I finally got out of bed and tapped it into my laptop. "When the children awoke they joined me and giggled at what I had written. They assisted me in the process and contributed the words kelp, kebabs, crabs and warthog. They were utterly thrilled at what we had achieved and at that point I knew I had to publish our creation. The journey has been confronting, yet I have never felt so passionate or filled with such purpose in my life." Zia Grace was raised with traditional Italian customs in the Melbourne suburb of Gladstone Park. Her parents established a printing business in 1977 and some of her earliest memories are of packing labels during school holidays. She moved to London in 1992, then relocated two years later to Gawler, South Australia - an historic country town neighbouring the Barossa Valley - where she met her husband, Patrick. The couple embarked on a 12-month world trip in 2005 and met their sponsor child, Rajalaxmi, in India. Zia Grace and Patrick are now based in Melbourne and frequently travel to their second home, Adelaide. They utterly adore their nephews, nieces and godchildren - Teague, Anais, Ayden, Tara, Foxx and Belle.